Water and flood damage can impact your home or business hard and fast, leaving you in urgent need of massive repairs! Thankfully, the team at Pro Restoration are experts in water and flood damage restoration and repair. Our experts are here 24/7 to ensure your restoration project is completed properly, ready to handle water damage caused from leaking pipes, damaged roofs, flooding and more. And our cutting-edge, environmentally-friendly solutions will have your home or business restored in beautiful condition. For reliable, effective water and flood damage repairs in Las Vegas, Henderson, and Clark County, you’ll definitely want to contact Pro Restoration. Accidents like overflowing bathtubs and broken toilets, causing physical damage to floors and walls. Flash flooding from natural disasters that can cause major structural damage to your building. Leaking roofs which may cause water damage to the structure of an attic, in addition to ceiling damage. The experienced team at Pro Restoration is here to help with all your water damage restoration needs. From standard drying and clean-up through water extraction to structural repairs such as ceiling leak repair, we can take care of damages caused by anything water or flood-related. Our licensed team will even deal with the insurance companies for you, providing the support you need when difficult repairs must be made. Prevent The Growth Or Spread Of Contaminants. No Job Is Too Small Or Large For Us. If you have any water and flooding damage in your home or business, the clock is ticking before mold begins to grow! 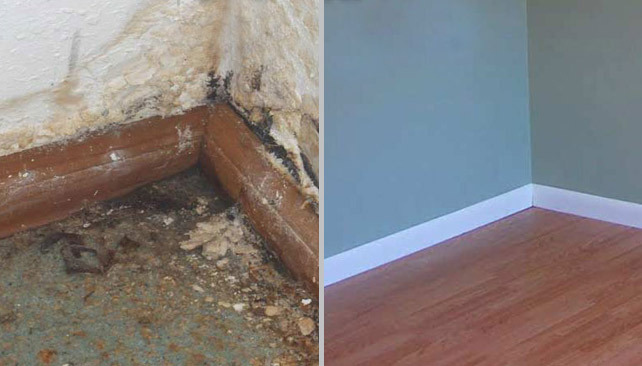 Depending on a few factors such as humidity, surfaces and improper drying, mold can begin to grow as early as 24 hours after your leakage or flooding! It is ideal to call a flooding and water restoration specialist like our staff members at Pro Restoration to determine the proper actions needed to prevent mold. 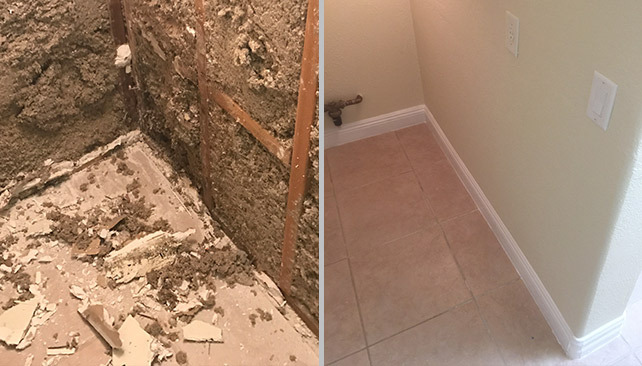 Our licensed experts and state-of-the-art technology will expedite the drying process through water extraction, which will prevent dangerous mold from growing in your home. 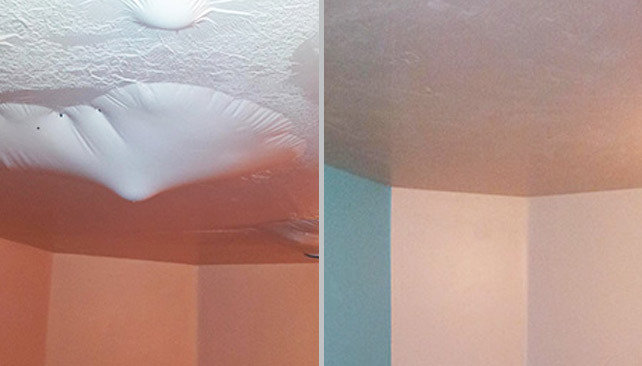 Our ceiling leak repair, drywall repair, and other repairs can make all the difference in stopping dangerous mold growth. And if our experts determine that mold has already surfaced in you home or business, we will take the steps needed for mold removal & remediation. First our experts will diagnose the problem and determine what steps need to be taken for proper restoration, reconstruction and repair. Next, any damaged or dangerous materials will be removed from the scene and we will extract your furniture and all your possessions from your home or business and move them into our repair warehouse. Here will we have a full team of specialists cleaning, drying and taking whatever actions needed to save and repair your flood or water damaged items and furniture. After your home or business has been successfully cleared, we will begin water extraction for you. This is the cleaning and drying process to remove water. Our experts will also conduct mold remediation if necessary. Next our team of experts will repair any structural damages such as drywall, ceiling leaks, plumbing, flooring and any other damages causes by water or flooding. Our team will repair and reconstruct everything back to its normal condition, including the paint on the drywall and floor replacement if necessary. Following our restoration efforts, we will then move all of your salvaged items from the warehouse and back into your home or business. Everything will be back to as it was before the flooding and water damage occurred! Pro Restoration’s skilled technicians are available at your convenience for water damage repair and restoration services. Check out our blog on the 9 Steps You Need To Take When Water & Flood Damage Strikes. 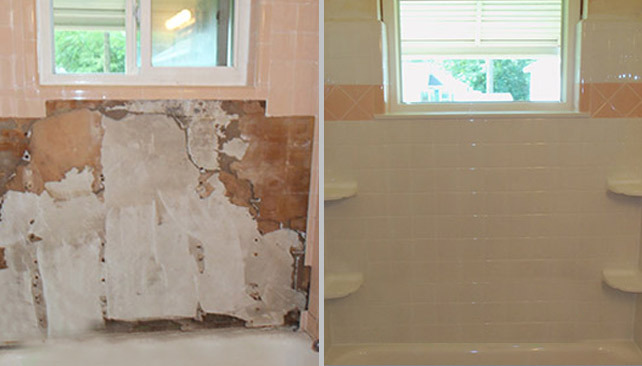 Pro Restoration’s water damage repair and restoration services are fast, reliable and most importantly, effective. 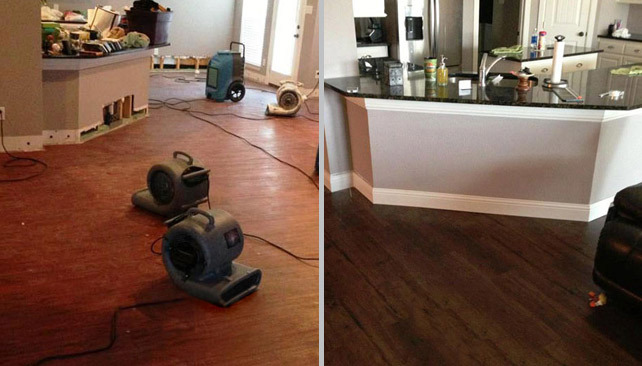 If you’re looking for water or flood damage restoration services in Las Vegas, Henderson, or anywhere else in Clark County, contact Pro Restoration today.